Okay, folks – it’s finally happening … OUR FIRST HOME RENOVATION PROJECT OF 2018! *cue the cheers* Yeah, yeah okay. I get it. Not that exciting. 😉 But, for us it is because we took an extended hiatus from all projects the last half of 2017. I even shared a couple posts (here and here) about all our plans and what not, but it just didn’t happen. Our Chip and Joanna alter-egos needed a break. Now we’re back and ready for some demo, starting with our laundry room! This is the last room on the first floor of our house that needs to be updated, and then we are dunzo. What a feeling. 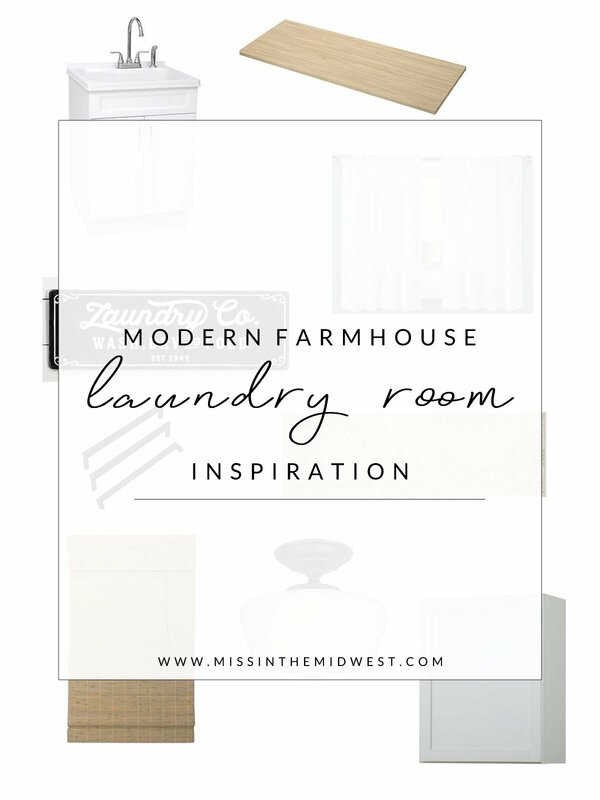 So, I’m serving up some modern farmhouse laundry room inspiration today. 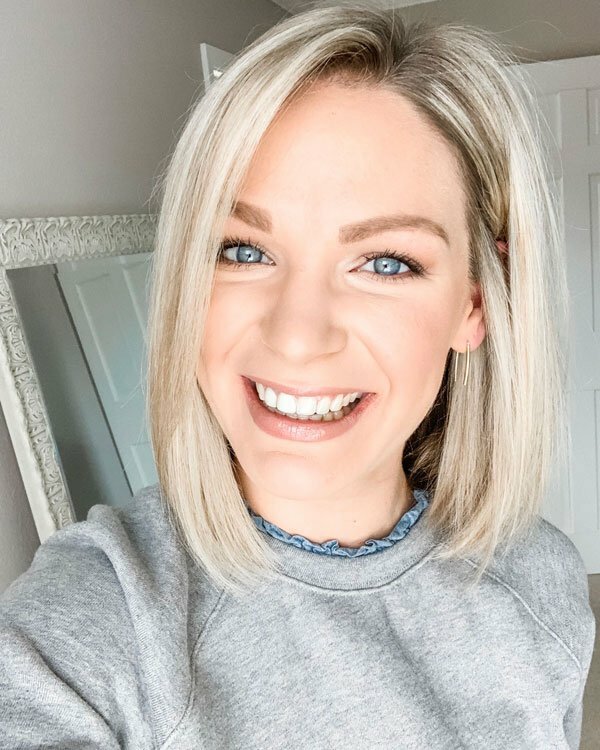 Like, one affiliate link is used in this post. Thanks in advance for the clicks if you’re looking for curtains! So, we don’t have a lot of room to work with, but that’s okay. Some people have their laundry in the basement. Or a closet. Or no room at all! I’m at least grateful that ours is hidden away in an easily accessible space. Isn’t it kind of funny to see and compare what this room still looks like compared to all the updates we’ve made? The oak! The cabinets! The creamy, yellow walls! Yuck. Equal parts hilarious and shiver-inducing. 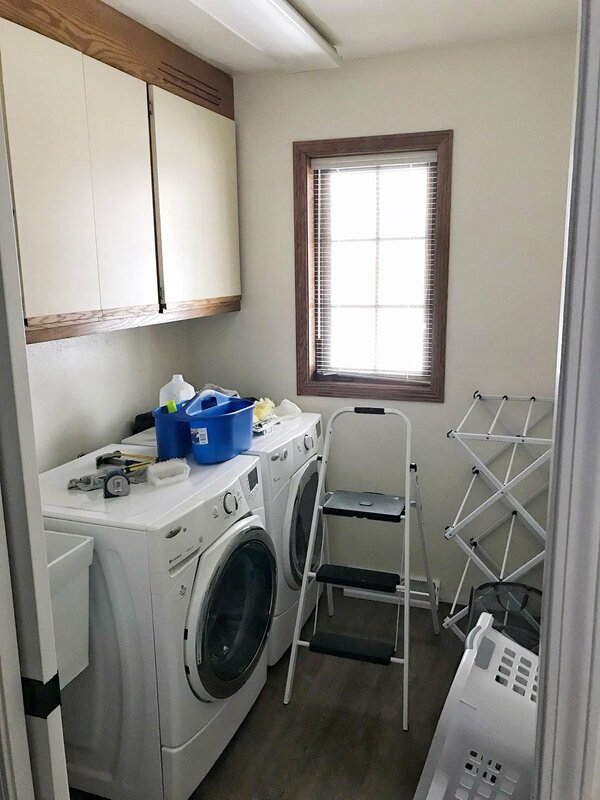 Since our laundry room is on the smaller side, our goals for the space are pretty straight-forward – update the furnishings and keep it functional. Easy, right? Famous last words. Here’s what we’re thinking. Obviously, those outdated cabinets have got to go. Buh-bye now! We are putting new white cabinets back up in their place, but they’ll be hung on opposite ends with a drying bar between them. Whoever thought it was a grand idea to have a six-inch drying bar above the utility tub was a real genius, if you ask me. (Yeah, no). This will be way prettier and functional, and we’re not losing any storage space. Score. We also purchased a utility sink cabinet to replace the current utility tub. Those things are typically ugly as it is, so I’m happy that we were able to find something that still works for it’s intended purpose, adds storage, AND looks cute. Ryan plans to build a shelf to install along the back wall above the washer and dryer, both for storage purposes and to avoid anything falling behind there. I’m also hoping for some sort of counter on top of the machines for folding purposes, so we will see what my handy hubby comes up with. Beyond that, it’s just paint (Zurich White by Sherwin Williams; here’s all the paint colors we use in our home) and a few decor items. We went back and forth about adding shiplap wainscoting like we did in our half bathroom, but ultimately we decided against it. Not that we don’t love our shiplap, but we’re pretty much the only ones that see the laundry room so it doesn’t matter much. 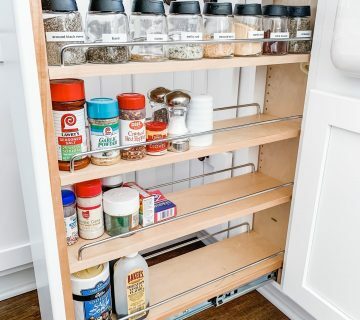 Plus, it’s not like we’re moving anytime soon (that we know of), but we’re at the point with house projects where we just want everything to look nice and updated without a ton of extra work. My guess is that will serve us just fine when it comes time to sell anyway. It’ll be fun as we progress to check back against this original modern farmhouse laundry room inspiration to see how closely the two resemble one another. 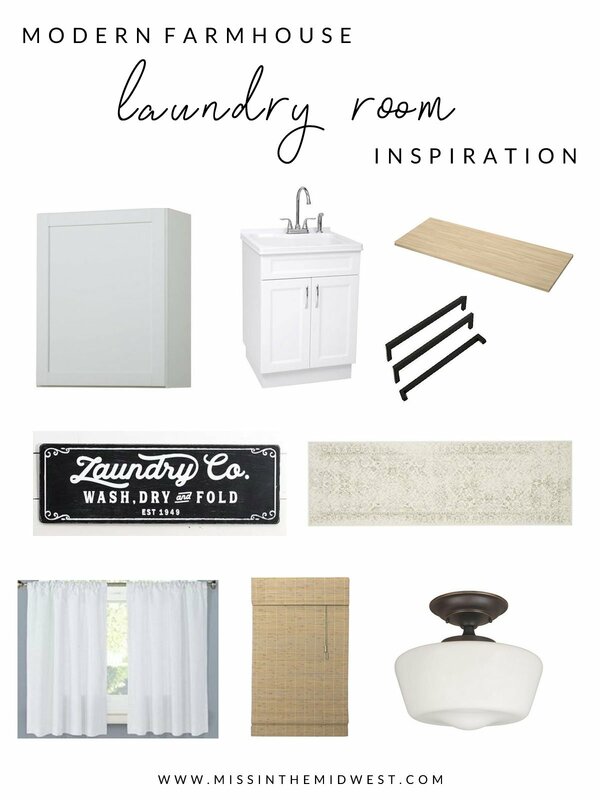 If you have any tips or suggestions for laundry room renovations, be sure to send them my way! 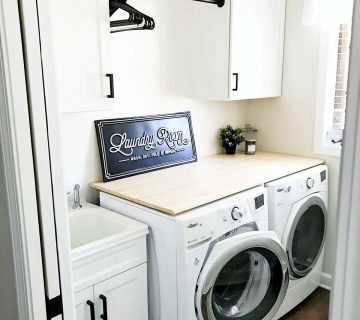 Do you have a pretty space to do laundry? Or, is it just out-of-sight/out-of-mind? My “laundry room” is 100% in a corner of our dusty old basement, lol- so at least you’ve got some good bones to work with! I love your aesthetic- I’m sure this is going to turn out amazing! Thanks, girl! Our old rental house had laundry in the basement, so I’ll take any sort of upgrade! Ahhh LOVE this! Can’t wait to see the finished space! I’ve been begging for a counter top in our laundry room for years now so I can fold everything in there and keep it all in one spot. Thanks, girl! Ryan is confident that he can build a countertop, so I’ll be anxious to share the results! That is going to be one pretty laundry room lady! I can’t wait to see the final product! I wish my home was big enough for a laundry room. 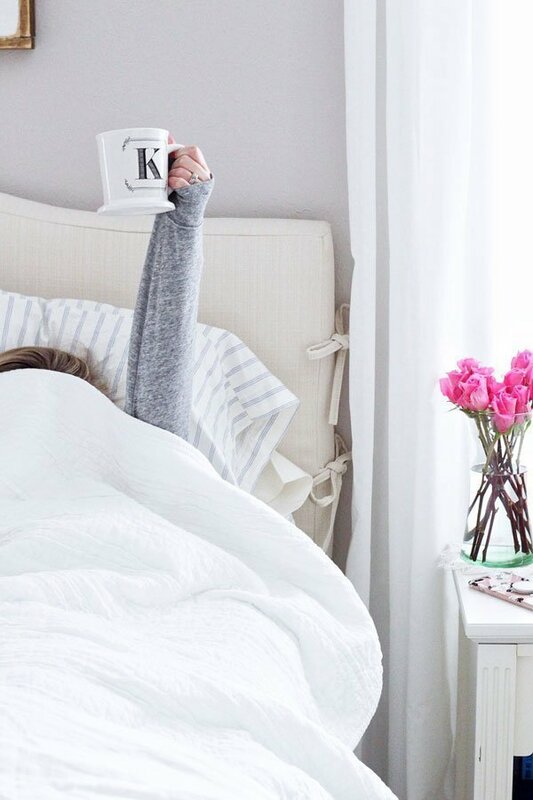 Love the inspo! I know that we are fortunate to have any sort of laundry room. Thank you! I love your ideas! I bet it will look great. Also, I bet they hung the bar over the wash basin so it catches any drips from your clothes (especially if you hand wash anything). Can’t wait to see the finished product! That never even occurred to me – I’m sure you’re right! It really only was a pain when I have to hang dry dresses because I didn’t want them sitting in the tub. Love everything you’ve picked out and I’m sure your laundry room will look fantastic when finished! We spend a lot of time in there so it’s worth it to make it look good! YASSS! I’m super excited for this post and your reveal post! 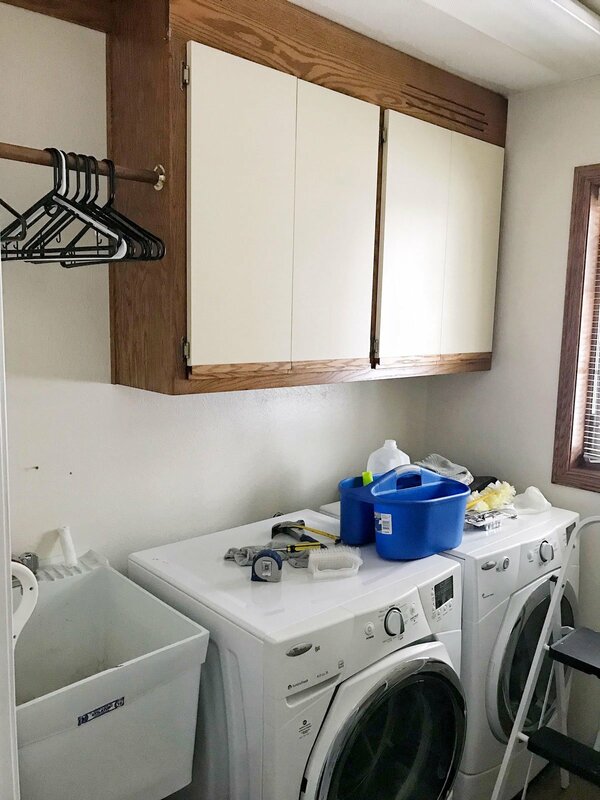 We have about the same size laundry room and I have no idea how to make it ‘cute’ or even more functional!! You are the best with these home decor ideas! My laundry room is basically a closet so jealous of your space! Can’t wait to see how it turns out!! Yeah! Always a good project to tackle when you’re ready – I think we put it off for so long since we’re the only ones who really see it! 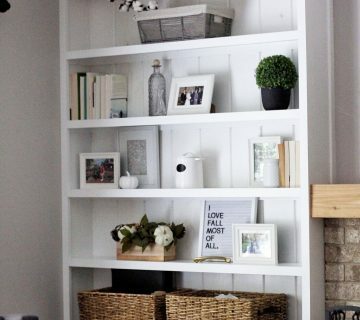 Can’t wait to see how it turns out – your renos are always so cute!